Once the snow melts, this ski-resort destination dons a whole other personality, with an abundance of awe-inspiring, shirt-sleeved outdoors activities from dawn through dark. Park City, Utah. Photos by Susan L. Ebert. Park City, Utah, has made its bones as a world-class snow sports destination, the home of the Sundance Film Festival, and the site of the 2002 Winter Olympics—and justifiably so, as winter’s when most of its 600,000 annual visitors flock to town. Once a flourishing silver-mining town—its Silver King Mine was considered one of the world’s richest in 1892—Park City turned its focus from mining to skiing, opening the 10,000-acre Treasure Mountain Resort in 1963 on miner-owned land. And although Park City now boasts the largest ski resort in the nation, this historic, small (population 8,378) city offers an abundance of activities and adventures in the summer months—when idyllic daily temperatures in the 70s and 80s and crystalline mountain nights provide a comfortable climate for horseback riding, fly fishing, rafting, mountain biking, hiking, and exploring by day with an array of culinary, cultural, and entertainment options by night. Historic Park City boasts 64 Victorian-era buildings on the National Register of Historic Places—many of them painted in vivid hues. This pigment-rich palette, once signifying wealth in a time when brightly colored paint came at a dear cost, extends to newer structures as well, giving the entire town the feel of a multicolored jewel box tucked into the surrounding mountains. 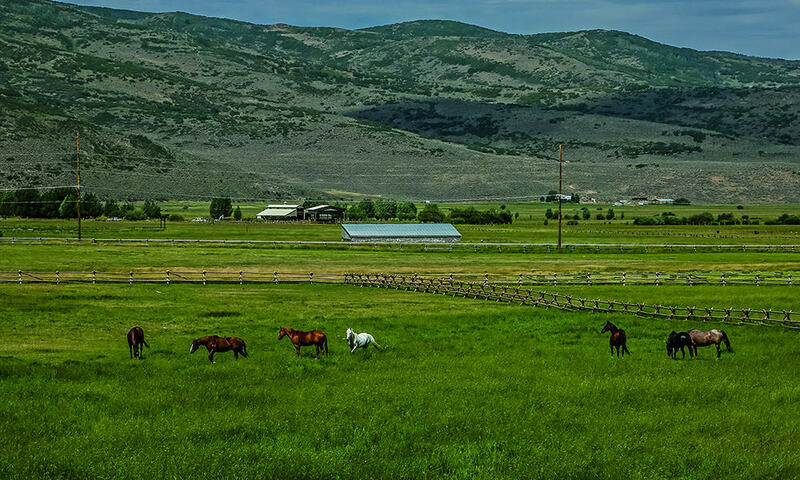 And like a jewel box viewed from afar, Park City beckons the viewer to take a closer look. Horseback riding opportunities abound, with numerous outfitters and more than 450 miles of trails. Rhodes Valley Outfitters offers both on-ground adventures, such as its Horse Experience, and trail rides. 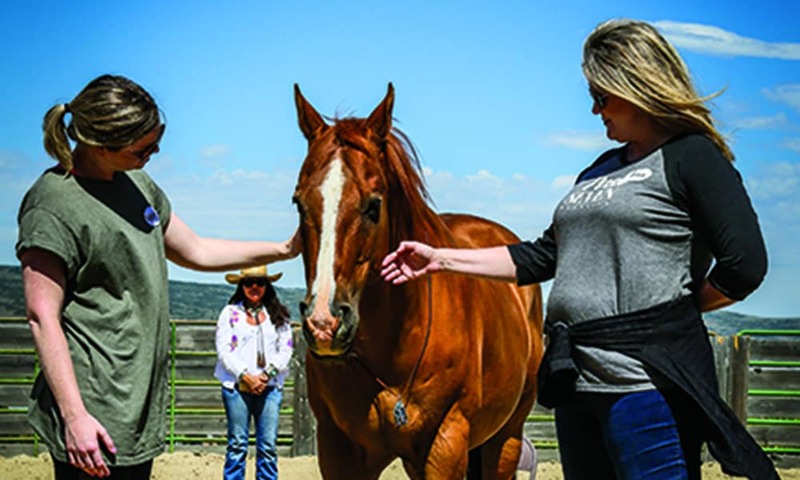 In its Horse Experience, participants interact with horses under the guidance of an equine facilitated-learning coach. I’ll admit; it was a little “New Age-y” for me at first, but during the hour-long session, Norm the Nibbler transformed me from a stressed-out journalist into a serene Ute Indian princess as he whuffed agreeably into my ear and rested his head atop mine. 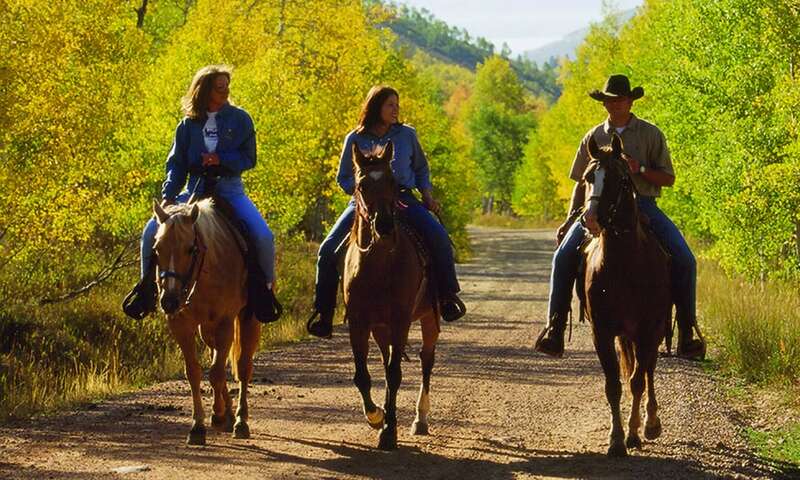 Three horseback riders enjoy Park City’s beautiful fall scenery. Ride out from High Star Ranch, with more than 800 acres of trails traversing the Uinta foothills. Afterwards, sample the Western-inspired cuisine at the State Road Tavern & Restaurant at High Star Ranch, tucked into the DeJoria Center, brainchild of billionaire philanthropist John Paul DeJoria, co-founder of Paul Mitchell hair products and founder of Patrón spirits. The 13-mile stretch of the Middle Provo River, between the Jordanelle Reservoir and the Deer Creek Reservoir, flows through the scenic Heber Valley and is considered one of the nation’s blue-ribbon trout streams, hosting a prolific population of brown trout in the 16-to-24-inch range. It’s so incredibly beautiful it’s as if you’ve walked into a living postcard. I meet up with the guides from All Seasons Adventures—they guide rafting, mountain biking, dogsledding, and snowshoeing, too—at the quaint-yet-hip Woodland Biscuit Company, housed in an early 20th-century general store that teems with trout bums, mountain bikers, and adventure-seekers. After devouring my grilled chicken tortilla lunch, I jump in with the guides to one of the river’s access points, where I shuck into the provided waders and boots as my guide rigs a flyrod for me. The walk-in is about a mile on well-marked trails, and we step into the river at a U-shaped bend with the promising name of “Cutthroat Corner.” Walking and wading, we cast bounce rigs in thigh-to-waist-deep gin-clear burbling water, and are oft rewarded with strikes by slick brown trout, which we bring to hand, admire, then release. Take your saddlepals to the PRCA-sanctioned Oakley Rodeo, where rodeo attendees most likely outnumber the 1,657 townsfolk. Held for four days around the Fourth of July, the Oakley Rodeo began in 1930 and maintains its authentic Western vibe with thrills, spills, rodeo food, vendors, and plenty of dazzling fireworks in this scenic Kamas Valley town. Tour the High West Distillery on the 3,500-acre Lodge at Blue Sky in nearby Wanship for a peek at its handcrafted 1,600-gallon copper still, a lesson on the distilling process from grain to glass, and a sampling of its signature bourbons and ryes, including the smoky Campfire and the cowgirl-friendly Yippee Ki-Yay, a blend of malted rye, barley, and corn—aged in white oak and finished in French wine barrels. Fox School of Wines’ Mines and Wines tour exceeded every expectation: Led by vivacious Certified Executive Sommelier Kirsten Fox with able assistance from sidekick Hannah Duprey, the three-hour tour kicks off with an overview of mining history, then proceeds by luxury van to historic mining sites such as the Daly West Mine, the Ontario Mine, Miner’s Hospital, the First National Bank on Main Street, Silver King Consolidated Headquarters, and the Red Light District. Fox narrates historical high points with wit and charm, accompanied by thoughtful pairings of wines and light nibbles. History never tasted so good! Although Park City bills itself as “Winter’s Favorite Town,” it’s fast becoming summer’s favorite town, to boot. Its spellbinding scenery, range of outdoor activities, and affordability is only exceeded by the friendliness of its townspeople. Stroll the historic downtown, dotted with restaurants, taverns, and shops—and enjoy al fresco dining in the clear mountain air. Tuck into a gourmet picnic basket at Deer Valley’s Snow Park Amphitheater as the Utah Symphony Orchestra plays an enchanting accompaniment to the setting sun. Lift your glass and vow to return.